2018 WGE Monaco Postponed: Live, online and mobile gambling technology trade show will take place December 2019. In the earliest hours of Friday, November 30, 2018, the announcement came down. Then event was canceled. “Postponed” is the word they’re using, assuring interested parties that the show will go on. However, it won’t go on until twelve months from now, in December of 2019. The World Gaming Expo is—or was—meant to be an annual trade show for the global, live and online gambling industry. In its 2017 debut, the event brought together industry leaders, regulators and producers from the gaming industry, as well as media partners to spread the word of accomplishments and accouterments of their trade. The gaming industry is steadily evolving throughout many parts of the world, from the US and Canada, to Europe, to Asia and Africa. Being a classic destination for gambling activities—home to Monte Carlo, that is—Monaco delivers the perfect platform for bringing together the industry’s entrepreneurs and experienced veterans to network, share ideas, and build a more cohesive future. As much as they’d like to do that from December 4-6, 2018, as originally planned, it’s not going to happen. It seems organizers weren’t able to manage their bankroll very well, leading to an abrupt cancellation just days prior to what should have been the “2nd Annual WGE Monaco”. Remove the word “annual” from the equation and it’s an easy fix. 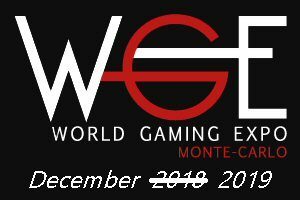 Now, the “2nd World Gaming Expo Monaco” is slated for December 2019. Managing Director of the event’s organizing group, Igor Gamba, explains that the WGE Monaco was postponed due to a lack of funding. Monaco International Events SARL was unable to raise the necessary capital to host the event, resulting in the forced development of a “new business structure” and 12-month hiatus. Gamba anticipates the 2nd WGE Monaco to welcome “60 exhibitors carefully selected and distributed over an area of 4000 square meters,” within the Grimaldi Forum Monaco in December of 2019. An exact date has not yet been announced, but organizers promise it will not interfere with the schedules of any other live, online and/or mobile gambling technology trade shows.